I stood at the reserves desk in the library where I could check out the assigned reading. This was in the fall of 1985; I was a junior in college; and this was before the age when text could be digitized and placed on the web. When professors assigned readings, students had to buy or borrow a physical copy of the text to read it. Kathleen M., a senior who was passing through, saw me and walked over. She was funny, and I liked her. “What are you doing?” she asked me. “No one does the reserve reading,” she remarked. She smiled. “What?” Wait a minute, I was thinking. She’s a brilliant student. (Kathleen went on to a top-tier law school.) Don’t all good students do all the reading? I did all the reading. It was killing me. “Only read what you need to, is what I mean,” she said. To me, reading meant starting at the cover, turning to the first page, reading the first word, and reading every word until I got to the last page — all the while taking notes — and doing this for every item on the professor’s list. Kathleen explained that I should look at the syllabus, see what was coming up next in class or exams or papers, and skim what seemed most relevant to what the professor was covering. “You can kinda tell from the syllabus,” she added. The librarian returned, and I took the folders full of photocopied book chapters back to my table. I got out the syllabus and looked at lecture topics and exam and paper descriptions. Indeed, it was all right there, a set of clues as to what to read (and what to skim or even skip) embedded in the class schedule. I didn’t read all the assigned reading word-for-word, that night or ever again. I figured out how to read what I needed to. This was a paradigm shift for someone who (a) loved (and still loves) to read and (b) took some pride in her academic duties. Interestingly, I became a better student at that moment because it prompted me to start managing my work, as opposed to simply doing it, and I also believe I learned more. I also started talking more in class, which helped me learn more and become more visible. At the same time I taught writing classes, I was working in Academic Support as an advisor and writing tutor. Often there we gave students tips for managing workload, and sometimes these tips were not unlike the ones that Kathleen M. gave me. They boiled down to this: Be deliberate, not passive, not slavish. It was an interesting professional situation for me, to straddle two camps. On the front lines (in the classroom), I encouraged students to read the book. Behind the scenes (in the tutoring center), I coached students in managing the reading of the book. I looked at it. All the ideas were sound, but I thought 10 seemed like too many, so I crossed out half and made it a 5 Things list. Then I put it aside, on purpose, to give me time to meditate on the list. I also questioned my own motivations. Did I even trust Eli to do well in school, to own his experience and make it into what he desired? Was I as tolerant of trials and errors — in my children, in my students too — as I hope myself to be? So, the list of 5 Things disappeared. Honestly, though, the story with Kathleen M. kept scratching at my consciousness. Of all the takeaways from my undergraduate days, this stays with me as the most helpful piece of unsolicited advice (and, believe me, I am a connoisseur of advice). And so I permitted myself to send Eli one email with one tip. 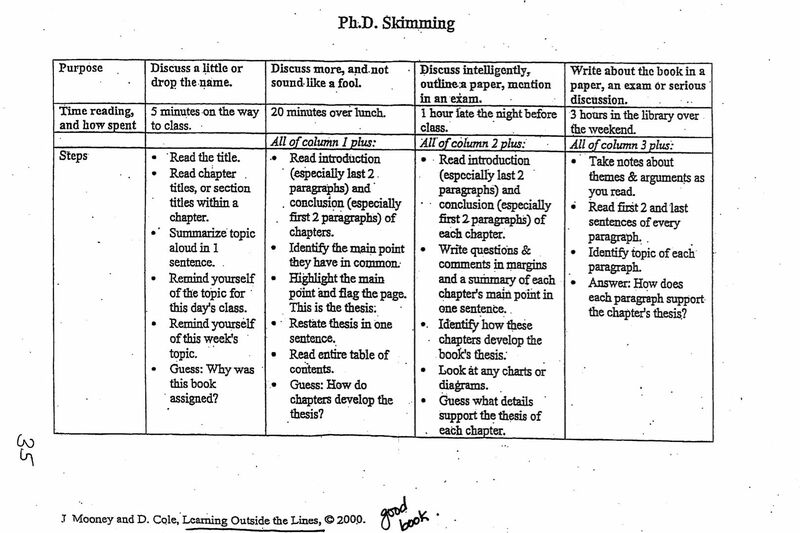 The subject line read, “How to cheat on college reading.” I attached a grid (the image is above) from Learning Outside the Lines (2000), by two just-out-of-college grads, which concisely and brilliantly lays out a methodology for when and how to do assigned reading, depending on the purpose and the time you have (from 5 minutes to 3 hours). I first came across the grid at a seminar I attended at Landmark College a few years ago. I even use it myself, like when a colleague hands me a long article the day before a staff meeting and says, “We’d like everyone to read this by tomorrow.” Perhaps the expectation is that I’ll spend 3 hours and read it word-for-word. Perhaps all the time I have is 15 minutes. So I read the title, the abstract, the section headings. I read the intro and conclusion. I skim and see if anything attracts my interest, and then I read only that passage closely. That makes me ready enough to discuss it, or at least listen intelligently. So I am spreading the word. The PDF to “Ph.D. Skimming” is here: college reading_tips. P.S. Teacher friends, what do you think? 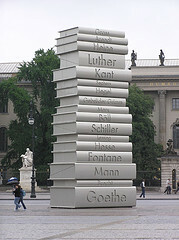 Image of a monument to “un-German” books burned by Nazis is by Chang’r on Flickr via a Creative Commons license. I want to go to Berlin and see it. Your entry reminds me of a similar moment I had (sadly, not until most of the way through my PhD program). I decided then that how much reading you do depends on what kind of reading you are doing: a poem needs slow careful attention, ditto for a short story where every word counts, but many informational essays and scholarly articles can be managed in the way you describe. So now I am meditating on how this strategy would work when it comes to teaching first-year college students how to overcome an issue I often observe in their reading comprehension: mistaking the counterargument for author’s own stance. Seems like teaching around this has to do with helping students observe 1. that there are counterarguments and 2. that there are phrases commonly used to highlight those counterarguments. Maybe the graph presumes that students have already moved beyond that point? What do you think? Good question. I do not think that the authors of Learning Outside the Lines elaborate what they mean by “topic sentence” or “main point” further in their book. Yes, I think they’ve assumed that students know something about a text and how it works. Or perhaps they’ve assumed that this kind of instruction is handled by teachers (and not by their book). I do think that all teachers, and not just writing teachers, could give students some advice on how texts in their disciplines are structured and how they work. For your particular situation, have you ever looked at or used Gerald Graff’s book, They Say/I Say, about common moves in persuasive writing? I think there is something in there about counterarguments. I really like the heuristic approach to his book. It might be interesting, too, to assign students in teams to map out a schema of phrases used to highlight counterarguments and see what they come up with. I love this — less of a ‘cheat’ and more of a smart survival technique! We have tutors coaching students to do much the same thing; a lot of students struggle a lot with how much time they should spend on things. That said, I agree with Betsy that this mostly applies to scholarly work, and I think you can decide for yourself what to spend more time on; for example, for an English major I think it makes sense to spend a lot of time reading the novels that are the primary texts for the class, while maybe doing the skimming for other classes. Skimming and selective reading really are important skills to have. But at the same time, I often wonder why so much reading is assigned. What is the point (particularly at the undergraduate level) of assigning so much reading that students don’t have time to read it all? I would rather assign less and have my students read it all.